This is the equivalent to the alcohol content of some freshly squeeze orange juices. Yeast is needed for the fermentation to turn the grape juice into wine. But prior to bottling all yeast cells are filtered out. We use 3 different filtering systems to take out absolutely all the yeast cells, otherwise, the wine would start to ferment again. This is why we can say that the alcohol free wines do not contain yeast. We do not add any grape juice to our wines. Many other companies do! The percentage of sugar (beet sugar )in our wines is about 4%, which is 40 to 45 grams per liter. Sulphur dioxide is a preservative/antioxidant which keeps the non alcoholic wine fresh and the colour stable. We do not use any coloring in our products. Our alcohol free wines are vegan. We do not use any animals or animal products in the production of our wines. Only Bentonit (which is a ground clay/stone)is used for the clarifying process. 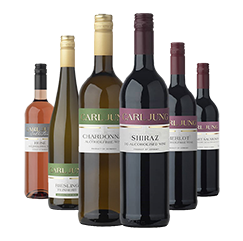 Non alcoholic Carl Jung Wines are made from regular red or white wines. The alcohol is removed by a vacuum extraction process without compromising the flavours and aromas. The grapes are not considered to be organically grown. We do not know of any gluten contained in our products. We do not use any flavours except for the dealcoholized sparkling Peach. But even there in the specification there is no hint of glutens. The tannin is not changed by the dealcoholisation process. Because of the reduction of volume (= taking out the alcohol) the tannins and other wine extracts are even more concentrated. This means that our alcohol free wines have about 12% higher tannin values than in the base wines.